As a restaurant owner, you know you’re in a highly competitive industry. Currently there are more than 81,000 places to eat out in Australia. , and more are opening daily. On top of that, it’s a consumer-driven industry, and with the amount of consumer-generated media available, word of mouth travels fast. Because of this, restaurant owners are under more pressure than ever to make a good first impression when they open their doors. Considering the amount of pressure on a restaurant’s grand opening, many restaurateurs are adopting the soft-opening model. A soft opening allows you to test your concept, your food, and your service with a limited number of people before you open to the general public. Practice makes perfect: From the front of house to the back of house, you have a lot of moving parts. A soft opening allows you to observe and train your staff in a live but controlled environment, so you can fine-tune your food, service and operations. Get real feedback: Before you officially open, it’s important to solicit feedback. A soft opening allows you to gauge customer reactions to your restaurant concept, menu and service so you can make tweaks where necessary. Generate buzz: On your grand-opening day, you want customers lining up. While there are various ways to market your restaurant (social media, email campaigns, etc. ), word of mouth is one of the most efficient ways to drive traffic. If you have a successful soft opening, you can build hype for opening day. Create revenue opportunities: By handing out coupons, BOGO deals, or other promotional offers at your soft opening, you can set up future revenue streams. If your soft opening goes well, chances are good your guests will return. What are some drawbacks to a soft opening? Time: When you host your soft opening, you should do it with a grand-opening date in mind. Ideally, your grand opening should come soon after your soft opening, so you capitalise on hype and potential customers don’t lose interest. If you decide to have a soft opening, it creates some urgency for your official opening. Expense: In the time leading up to your grand opening, you’ll likely be dealing with a number of variables, including construction, renovation and licensing. During that time, you’re paying rent without revenue. Considering this, most restaurant owners want to open as quickly as possible. But if you opt for a soft opening, you need additional days or weeks before officially opening, which means more time without revenue. It will also probably require a series of events, and you may be providing free or discounted food and drinks. Effort: There’s a lot to do when you’re preparing to open a restaurant. In addition to renovations and permitting, you need to focus on hiring staff and marketing. 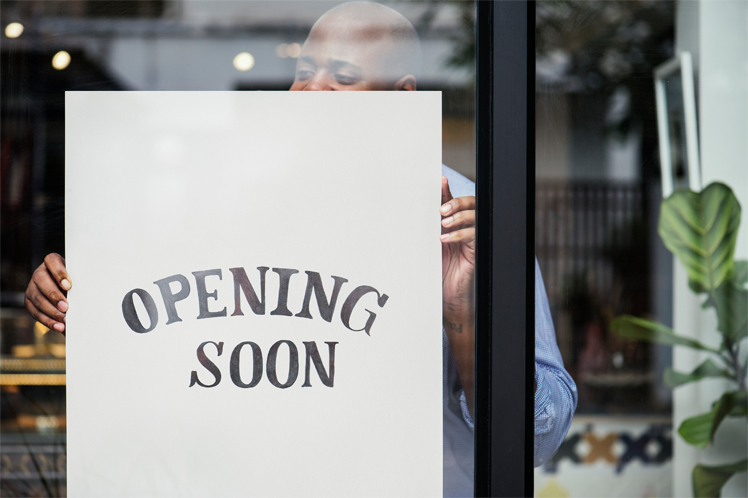 Regardless of your soft-opening format, it requires a lot of energy and planning to orchestrate, which can feel overwhelming in the days leading up to your grand opening. When thinking about what to serve at your soft opening, there are a few factors to consider. First, you should think of the menu as a preview of your larger menu and focus on a simple, limited menu. This also helps to conserve time and budget. And although you want to keep your menu limited, make sure it’s a diverse offering and includes some of your unique dishes; this will make your restaurant stand out and leave guests wanting to try more. Free: This can be the most effective way to garner feedback and create goodwill with potential customers, but it’s also expensive. Discounted: This is a good middle-of-the-road option. If you go this route, make sure to let guests know what the meal would normally cost. You also want to make sure press knows the right prices to report. Full price: While this is obviously the cheapest option for you, it’s considerate to offer a free drink or some other perk to incentivise people to offer constructive feedback. Planning: Your restaurant type should influence the optimal soft-opening format. For example, if you have a full-service restaurant, you may want to host a private party with cocktail-style food service. Whereas with a quick-service restaurant, you want to host a more casual soft opening with discounted food. Create a checklist to make sure you cover all key factors (cost, length, guest list) when planning your event. Executing: Create a timeline for execution and take the time to train your staff. Prioritise customer experience at your soft opening, as this is a critical opportunity to make a good first impression. Tweaking: Apply the learnings from your soft opening and make improvements prior to your grand opening. Review every aspect of your restaurant — from the menu to the wait times — and make adjustments where needed. Prep your staff: Before your event, talk your servers through the soft-opening menu. Have them do a tasting so they can speak intelligently about your offerings. Test your technology: Make sure to use your point of sale, card payment system and printers during your soft opening to confirm everything’s working properly. Talk with your guests: Train your staff to chat with each table and thank your guests for being there. This gives you a chance to get honest feedback so you can make improvements before the grand opening. Pay attention to customer service: Don’t expect guests to be more forgiving because it’s a soft opening. You only have one chance for a first impression, so make sure your customer service is on point. Take notes on anything that needs to be improved. Limit the number of guests: Seat a number that your kitchen and staff can comfortably handle, so you can successfully execute your soft opening. Keep your hours short: To ensure your event goes well, make sure it’s manageable. By keeping the hours short, you can stick to a budget but still give your guests a preview of what’s to come.